Holy crap this pregnancy stuff is exhausting. Yesterday I ran out of breath walking while eating an ice cream cone, and any “glow” one might detect in my face is probably from climbing, like, three stairs. Or possibly it’s the aftermath of an ugly cry, which was probably related to some snack I couldn’t have and probably happened in the middle of a crowded Safeway or 7-11. I have yet to become serene. I have yet to stop perspiring. It’s all very romantic. But I’m waddling around, because the pursuit of food is constant, and because the doctor said I have to eat protein and the only thing in my fridge right now is fruit (and there is so much fruit). Nick bought me a case of freezies and I am destroying it. With my face. I am getting all the exercise I need, but I can never eat enough. If you can imagine a sweaty Ms. Pac Man annihilating everything edible between Arbutus and Main, you’ve got a pretty accurate mental picture of me right now. No one may photograph this. 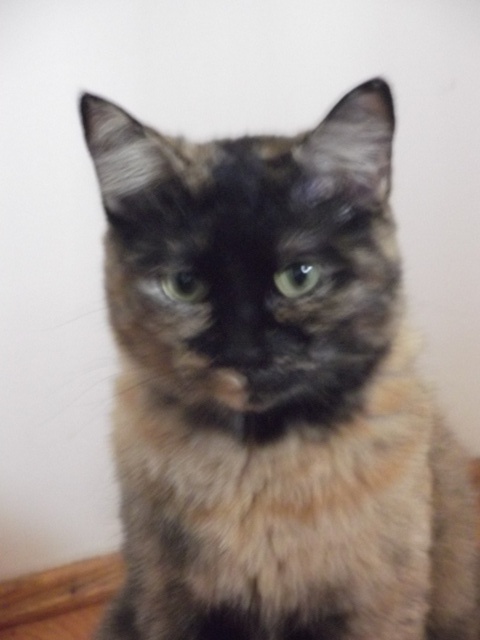 Even the cat is judgmental. To add to my confusion and exhaustion, I am also supposed to rest more. “I can tell just from looking at you that you’re the type to retain water,” my doctor said, so now I have to lay around with my feet up for 10 to 15 minutes, three times a day. It seems that the only time I can find to do this is when Chuck Hughes is on TV, and even though I suspect he’d be reluctant to run away with me now, I do enjoy his pretty face and his lemon meringue pie tattoo. And his cooking show. I found some time to lay around leering at Chuck this weekend, and it was fortuitous. 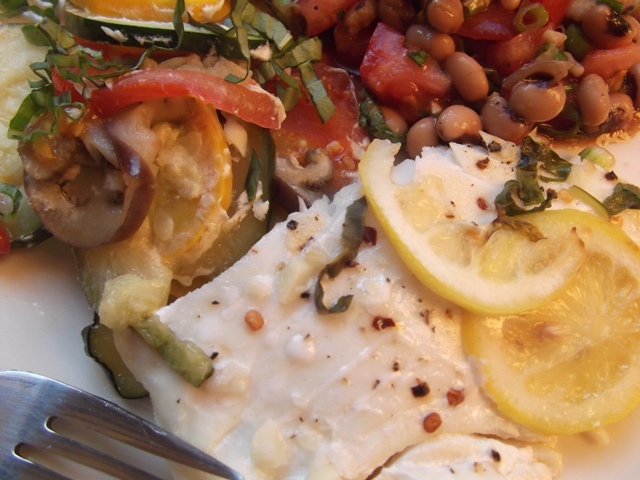 He was making a lovely, summery dish with black cod; the fishermen down at the wharf at Granville Island have had long fillets of halibut that would suit the dish perfectly, and the makings of ratatouille are now available at my little market. And so, because I need to eat more protein and because I learned the recipe while sitting around getting rested, I adapted Chuck Hughes’ Black Cod Ratatouille en Papillote to suit some lovely local halibut. 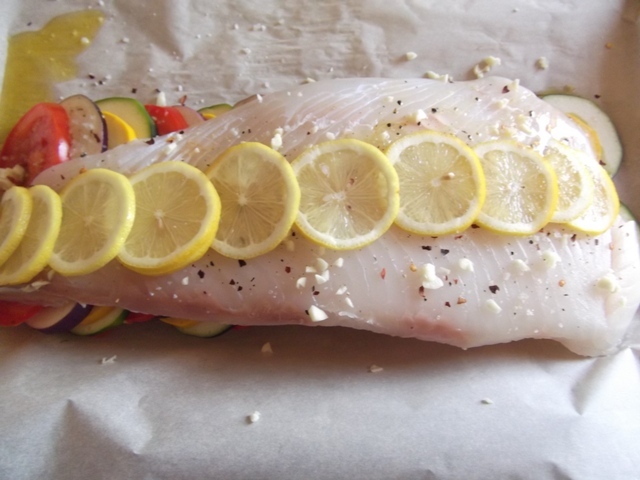 There’s not much sense in me re-writing the recipe here, as I literally did everything he did just with a different white fish (though I did add lemons, which was very clever), but I’ll show you how it went, and maybe you’ll make it yourself some hot day this week. It cooks in 20 minutes, and should feed four people. 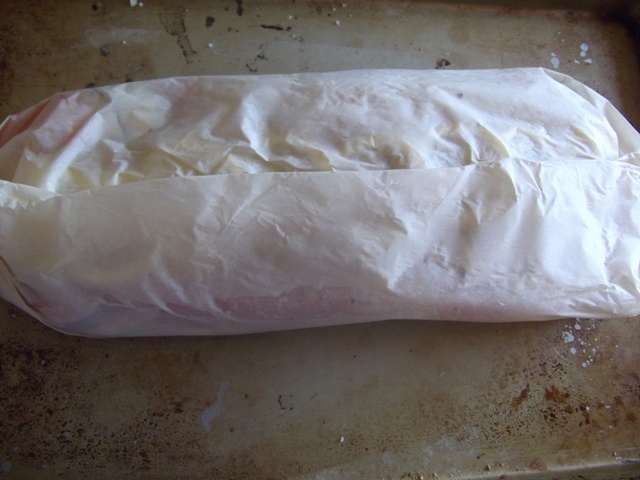 “En papillote” sounds complicated, but it’s really just cooking in a strip of parchment that’s been folded over in the middle to form a seal and then twisted closed at the ends. What results is a perfectly steamed piece of fish, and beautifully cooked veggies, and it’s easy and requires few dishes and you don’t have to have the oven on too long. You could use salmon, or the long fillet of whatever fish that’s in season where you are. 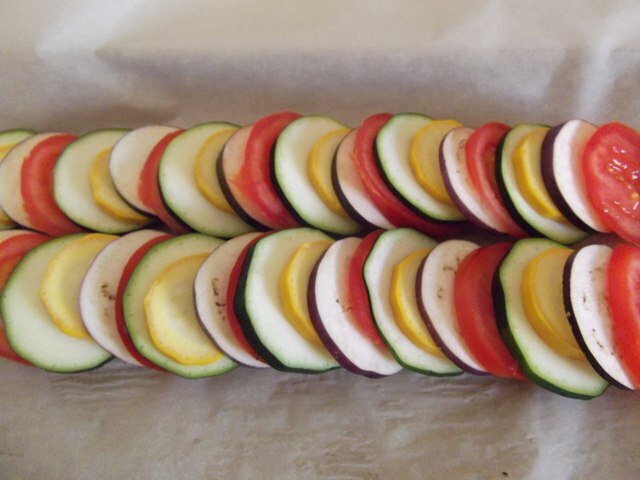 Serve with salad and lemonade. < Previous Zucchini parmigiana sandwiches. He ocean fishes?! That’s how you know he’s a keeper. I keep trying to send Nick out to sea but there are always reasons why he can’t go. This post made me laugh aloud. 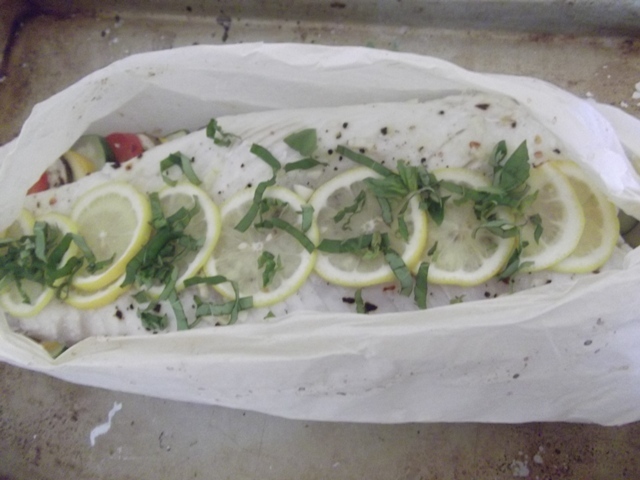 I love fish en Papillote, it’s always so aromatic and your pictures are fabulous! I think I will definitely give this recipe a try. It is indeed exhausting — nap aplenty, it’s good for you and you’ll feel virtuous for having done it, as opposed to the usual naughty, vaguely shameful slothfulness. At least I did. I am told that it gets easier when they’ve got a couple years on them… eeek! I will tell you now that it is easier at first, even though it’s hard, than it is once they start crawling and grabbing things and acting like small robots set on self-destruct. And your Space Raptor is going to be a rocket, I just know it. I think your destructive small robot is pretty cute, so I imagine it’s not too bad! I’ve been plotting the raptor’s movements and I don’t know if he’ll be a rocket … he’s a bit on the lazy side so far. Fingers crossed. Nick is a sleeper, so I’m hoping the dinosaur takes after him. Then maybe they’ll both be asleep all the time and I’ll get so many things done!